Why do we play video games? It’s a fairly simple question really, and the most obvious answer is, we play video games to have fun. Whatever your specific reason for playing video games, whether it’s an escape, a break from the world around you, you want a challenge or just something to do, whatever it may be, it comes down to, you want to have fun. After all, if you weren’t having fun, you could always be out working and earning money; not that work can’t be fun, but with that, the point is money. With video games though, really, as long as you’re having fun, it’s all worthwhile. Of course, that can be said about any game, not just Super Mario Bros. 1. So, what’s that reminder doing in this review? Well, really, at its core, this game represents everything video games should be about, having fun. Fun isn’t a tangible thing, it’s not something you can wrap up in a box, put on a shelf and sell. If making a game fun was really that easy, everyone would do it, and it wouldn’t matter. While it’s easy to say you’re supposed to have fun playing a video game, having fun has different meanings to everyone, and it’s hard to get that perfected, stick it inside a piece of plastic, and ship it off to sell. That’s where this game comes in. This game is fun, made tangible, and now available for your purchase. In reality, Super Mario Bros. is easy enough to explain. You are Mario, and the Princess has been kidnapped. You can go it alone or play with someone else, the other person controlling your brother, Luigi. Play alternates when someone dies, with each person acting independently of the other. So, if one if you makes it past three levels and dies, then the other person starts from the first level and might make it past five levels and die, and then it goes back to the other person who’s still on the third level. With two players, it’s an independent race to see who can save the princess first. Controls are basic enough, the control pad moves you on the screen, holding down B allows you to run, and pressing A causes you to jump, or swim if you’re in water. 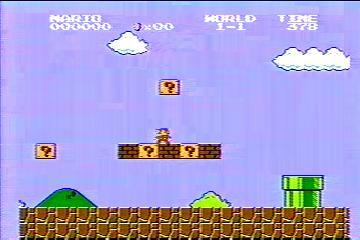 You start on the left side of the screen and move to the right until you reach the end of the level, and move onto the next one. Along the way you’ll encounter a number of different enemies. Most of these enemies are dispatched by jumping on top of them and squishing them, although it might not be wise to jump on top of something with spikes poking out of it. You’ll also come across blocks with a question mark on them, which when you jump up and hit them will yield a coin, 100 of which give you an extra life, or an item to increase your life. You start off “small,” and if you hit a block with life inside like that, a mushroom will emerge which will cause you to become “big.” If, while big, you hit a block that contains life, it will be a fire flower, which allows you to shoot out fireballs with A, which can kill most enemies. Getting hit while big or with the flower will cause you to go back to being small, and being hit again will cause your death. There are 32 levels within the game, although there are a few hidden “warp zones” which will allow you to skip ahead to a further level if you find them. That’s a general description of the game, but, it doesn’t really do it justice. It’s easy to explain what Super Mario Bros. is, describing what exactly makes it fun is something else. The fact of the matter is, not only is describing the game easy, but, in this day with all our advanced computers and whatnot, probably more than a few people reading this review, as well as myself honestly, could sit down and in a matter of a short amount of time make an exact copy of this game from scratch. It’s not really that hard. Making a game is easy, obviously there are a ton of companies now, not just the people sitting here reading the review, who can do that. Not only have other people and companies tried to take and improve upon Super Mario Bros. 1, but even Nintendo has tried to do so, with the Japanese version of Super Mario Bros. 2 (released in the US as part of Super Mario All-Stars, titled “The Lost Levels”). This game was basically an extension of the first game, in theory taking all the elements of the first one, and adding more levels, and a few new pieces of gameplay, such as strong wind gusts affecting a high jump. Now, this isn’t to say that the follow-up game was bad, it was still a fun game as well, but, whether creating or trying to improve on something fun, neither of them is easy. While it was still a very fun game, it in no way replaced Super Mario Bros. 1, where one might say “Yeah, the first one was ok, but the second one was everything it was and more, now we don’t need the first one anymore.” It still stands alone. There are a number of elements which contribute to making Super Mario Bros. 1 fun. Simplicity for one thing. You don’t have to deal with all sorts of strategic planning, trying to judge a wind current, or work with a variety of different controls, or anything like that. You run, you jump, an occasionally you shoot fireballs. That isn’t to say the game is easy by any means. 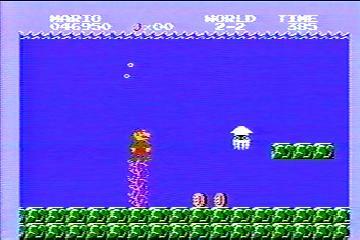 While, especially if one wants to use the warp zones, with practice one can easily zip through the game in a under half an hour, and even without using the warp zones, if you know what you’re doing it’s still not going to take much longer than that, there are still a number of challenging areas. There is a timer in each stage, set at 300 seconds. While this is usually more than enough time to complete any level, it does prove a sense of urgency, and at times can work itself a bit close. As well, it’s not as if you’re just running along a straight ground and occasionally jumping over a stray enemy, you’ll have to deal with a variety of enemies who you’ll have to tackle in different manners, as well as platforms and jumps and moving platforms and pits and other hazards like that. Still, while the game does provide challenge, it all comes down to its core of running and jumping, and that really is very fun. Another thing is the levels. While you don’t have detailed landscaped and intricate designs, not only are the graphics more than adequate, you’ll explore a number of different areas, which will really draw you into the game. Running across an open plain, ducking into a sewer, up in the air, or in a castle, there are many places for you to explore. As well, it’s not as if you’re just running along with only one path choice, just jumping or ducking as required, there are different paths for you to take along the way. Not only major hidden things like warp zones, but also smaller hidden things like beanstalks and pipes. Mario, being a plumber and all, will occasionally come across a pipe he can go down, leading to underground areas, usually consisting of coins for him to gather and will then send him out further along. There are also beanstalks hidden inside of some blocks, which lead you up into the clouds, to move along up there for a bit, gathering coins and eventually coming back down to the ground. All of the levels are very fun to explore. While much of this review might only sound like waxing nostalgic, and while there certainly are more than a few tangential issues that are covered, that shouldn’t in any way obscure the main point, that, even removing all else from around it, Super Mario Bros. remains an excellent game. Not only is it fun, but it will keep you coming back for more, just another run through the levels, seeing if there was a pipe or a block that you missed, or just because you wanted to give it another go-through. Still, Super Mario Bros. stands as a reminder of everything that video games are supposed to be about, to have fun and to enjoy yourself. While games have progressed much since this, it all comes back to the reminder of, yes, games can provide you challenge or strategy or planning or any number of other things that games contain, but, most importantly, a game needs to be fun. Super Mario Bros. is, more than anything else, just a fun game. If you could make fun a tangible object and put it in a container, you’d want to put “Super Mario Bros. 1” on it.